Physician and hospital networks known as accountable care organizations are saving Medicare big bucks, and greater savings could come from disease-specific programs. The most recent cost savings data for ACOs operating in the Shared Savings and Pioneer models showed overall gross savings for Medicare in 2016 of $713 million, almost twice as much as the previous year, a Centers for Medicare & Medicaid Services spokesperson told Bloomberg Law. One other ACO coordinates the work of end-stage renal disease providers. These in combination with a fourth ACO had a combined total gross Medicare savings of $836 million in 2016. Many ACOs are also planning to enter risk-based models, which give them the potential to earn more, but also potentially lose, money, according to a study by Leavitt Partners and the National Association of ACOs (NAACOS) in Washington. An ACO is a group of doctors, hospitals, or other health-care providers who work together to provide better, more coordinated care and reduce spending. ACO programs are voluntary and provide financial rewards for providers for high quality care. Some are made up entirely of physicians, while others include physicians and other entities, such as universities, hospitals, lab compnies, nursing homes, and home health agencies. The CMS established the Medicare shared savings program on Jan. 1, 2012, as required by the Affordable Care Act, and additional ACO programs followed in recent years. In an ACO network, the primary doctor would refer a patient to different specialists within the network, similar to an HMO, but specialists and doctors would be collectively responsible for that patient’s treatment and outcomes. Some of the largest ACO networks include Banner Health Network near Phoenix with more than 5,000 physicians; Advocate Physician Partners Accountable Care Inc. in Rolling Meadows, Ill., which has 6,300 physicians; and UnityPoint Health in West Des Moines, Iowa, with more than 900 physicians. The increase in Medicare savings through ACOs appears to correlate with the steady increase of hospitals and doctors entering these networks. 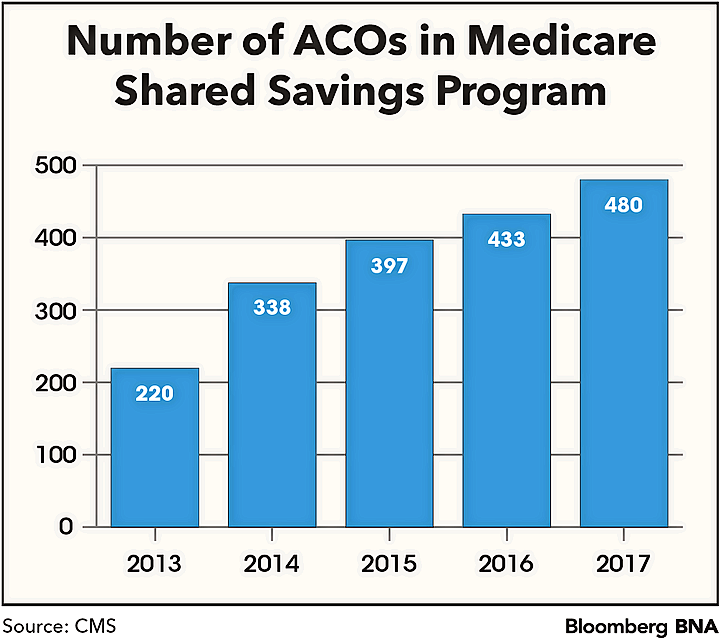 The number of networks in the shared savings program, the largest Medicare ACO program, increased from 220 in 2013 to 480 in 2017, a 118 percent boost. About 28 million people are covered under these networks. “It takes a long time to build a successful ACO and a lot of capital,” Allison Brennan, vice president of policy at NAACOs, told Bloomberg Law. The average cost for annual ACO operations was $1.6 million in 2015, according to a 2016 NAACOS survey of ACO participants, a heavy price tag for smaller and struggling hospitals. An earlier survey by NAACOS found that the average first-year start-up costs for ACOs in the Shared Savings program was $2 million and that ACOs would need to invest about $4 million of start-up capital before seeing any chance of recouping the costs. That’s higher than the CMS estimate of $1.8 million in start-up capital, from 2011 draft regulations, but much lower than estimates from other groups, including the American Hospital Association, which had estimated the average start-up costs to be $11.6 million to $26.5 million. 2016 is also the first year CMS made performance results available for Next Generation and Comprehensive ESRD ACOs which had a combined gross savings of $123 million in 2016. The Shared Savings and Pioneer had gross savings of $713 million, $247 million over 2015. Muhlestein said the CMS is planning to unveil more ACO models in 2018 and that disease and condition specific programs show promise for even more savings. However, Brennan said she has concerns about disease-specific models due to potential overlap with other programs. ACOs can save even more money by taking on greater risk. Under a risk-based track, health care providers must pay back a portion or all costs that exceeded the payer’s benchmark, but also have the opportunity to earn higher savings. Currently, 91 percent of ACOs in the Shared Savings program operate in the no-risk Track 1 option where the ACO members don’t have to pay even if they exceed their benchmark. A 2017 survey by Leavitt Partners and NAACOs found that 47 percent of ACOs are planning for higher-risk tracks and 38 percent are planning for capitalization. Each contract period in the Shared Savings program typically focuses on a three-year agreement, which can be renewed once before an organization is forced to move into a risk-bearing model. According to the Leavitt/NAACOs survey, 114 of these ACOs will end their final agreement in 2018. Brennan said one of the main struggles for ACOs that want to enter higher-risk models is the upfront cost. “They not only have to repay loses, but there is also an upfront investment for health IT and a required line of credit, which is about one percent of an organization’s cost of care. That’s a lot for many ACOs,” Brennan said. Brennan said riskier tracks might not be in every ACO’s best interest, including rural and smaller ACOs, which have smaller admissions.